The Secretary-General of the Council of Ministers, Dr. Mahdi Al-Alak, received in the Library of the Special Adviser and Head of the United Nations Panel to Investigate the Violations of Dahesh, Mr. Karim Asaad Khan, and the Legal Expert of the UN Team, Nicole Khoury. During the meeting, Khan reviewed the most important outcomes of his visit to Najaf province and his visit to the supreme religious authority, Ali al-Sistani, describing the meeting positively, describing it with moderation, humanity and equality among the Iraqi society. 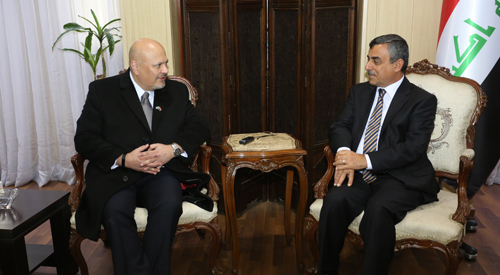 During the meeting, the two sides discussed the most important issues of mutual concern concerning the composition of the Executive Committee, naming the Chairman of the Committee and giving the green light by the Iraqi Government to announce the job description with a view to initiating the activities of the investigation in 2019. It should be noted that the United Nations Security Council adopted a resolution in September 2017 to bring to justice those responsible for war crimes. The team, led by British lawyer Karim Asaad Ahmed Khan, was sent to Baghdad in October, but has since focused on administrative and technical details to lay the groundwork for the investigation.